In the not-too-distant future, a hatch of unknown origins is found on the moon, leading deep blow the satellite’s surface and hiding secrets perhaps too dangerous to uncover. In Moon Chronicles, players take on the role of Major Kane, a soldier tasked with exploring a mystery ripped from the pages of Lost and Alien and forged in the fires of classic shooters like Doom and Wolfenstein. There aren't a lot of first-person shooters on the Nintendo 3DS, but Moon Chronicles aims to deliver an action-packed experience fans of the genre can really sink their teeth into. I'm experiencing something of a love/hate relationship with Moon Chronicles at the moment. While part of me enjoys the retro, non-cover-based shooting and cheesy Sci-Fi storyline, it's that same simplicity and unreliable aiming that have me pulling away from the game, not entirely sure if I actually want to finish the adventure. 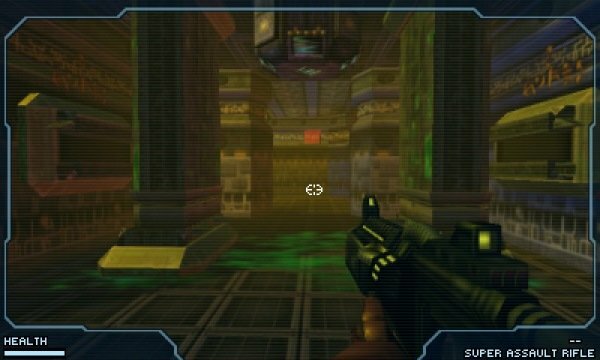 For the uninitiated, Moon Chronicles is a 3D remake of what many hail to be one of the best FPS games to ever grace the original Nintendo DS, Moon. Rather than remake the whole package and bring it out as a single entity, though, the team at Renagade Kid have instead opted to adopt a bizarre episodic model, releasing the game in four stages that introduce a little bit of the story at a time. It's a model that works splendidly for games like The Walking Dead, but it feels like an odd choice for a straight-up action shooter with a lack of plot twists or an emotional roller coaster that could benefit from some breathing room between chapters. It feels like the game was broken up for the hell of it and, due to their odd pricing model, it might actually turn some potential astronauts away. What I mean by “bizarre” is that Moon Chronicles' first chapter is $9, with the three remaining chapters set to cost players $1.99 apiece. There's no option for a season pass, either, so you can't just buy the whole thing up front ($15) and be done with it. That's unfortunate, since I'm sure that Moon Chronicles' 15 dollar price tag will feel suitable when the game is fully released. A $9 first chapter, though, is a little tough to swallow. The main chunk of story will take you about an hour to complete, and that's only if you're playing on one of the two harder difficulties. You can unlock an additional training mission, too, but that only bolts on a handful of additional rooms to explore. I can only assume that the plan was this: Get players to pay $9 for the first chapter. No matter how they feel about the amount of content vs. the price point, at only $1.99 for each remaining chapter, they'll almost definitely complete their purchase and pick up the rest of the game. I know it's an odd complaint, but I feel like these types of pricing decisions need justification and, in the case of Moon Chronicles, I just can't understand it. I would be much less preoccupied with the price point if I felt like I got more bang for my buck in this first chapter of Moon Chronicles. 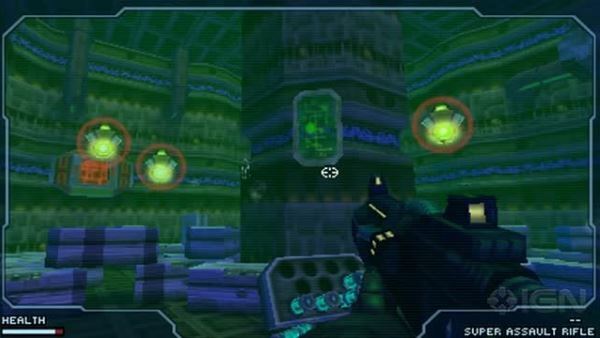 A throwback to shooters of old, the player's job is to move from room to room, clear all of the enemies without being overwhelmed, then repeat. There comes a point in the game when Major Kane actually comments that he feels like he’s doing nothing more than going to a blinking point on a map before uncovering more of the map with yet another blinking point to travel to. That might have been meant as a humorous wink to the camera, but calling out the monotony in a game doesn’t make it any less, well, monotonous. Moon Chronicles does an okay job of making that formula a little more interesting, giving players control of a little robot they'll need to use to squeeze through tight spaces and unlock doors. More creative players will learn to scout an area with the droid first, and even stun enemies before running in guns-a-blazing. Unfortunately, I can't exactly endorse said shooting. The majority of enemies zip around the levels as if they have sensors that let them know when you've finally lined up your reticule. The guns fire slowly, too, meaning you'll constantly be swinging your gun around, trying to pull the trigger before the enemy swings out of line, and failing. I was playing with the Circle Pad Pro, too, which you would think would add an extra degree of control. This wouldn't be so bad if the enemies didn't have great aim or they weren't small enough to require you almost be on top of them to shoot. They also take a ridiculous amount of damage from your standard rifle in the later difficulties, making for frustrating and sloppy shootouts. I started to get a feel for the aiming on my second playthrough but, even then, I was actively compensating for a gameplay mechanic that simply doesn't do well on this console. Not once did the shooting feel intuitive and seldom did I actually consider it fun. Also of note is the fact that there is no checkpoint system to speak of in Moon Chronicles, except for a couple of save rooms. If you die, you simply revert back to your last save with none of your progress carrying over. If I took a few too many hits, I found myself backtracking all the way to the previous save area just to keep myself from losing progress. I suppose you could argue that it's another “retro touch” utilized to make the game feel more like a classic shooter, but there's a reason that kind of system has been eliminated from most games. It's artificial difficulty, it’s frustrating, and that holds true in Moon Chronicles. And then there are the cutscenes, which looked washed out as all hell on the 3DS’ screen. In the first chapter of Moon Chronicles, we’re talking about maybe two minutes, grand total, of video content. It feels a bit lazy not to give these scenes a proper scrubbing or, considering how sparsely these scenes are used, maybe just rebuild them from the ground up. They’re pretty jarring, considering how decent the rest of the game looks, and I don’t understand why Renegade Kid wouldn’t want to go that extra mile to round out the package. In short, I was left wanting with the first chapter of Moon Chronicles, a game too formulaic for its own good and on a platform that is ill-suited for its twitch-based shooting. The game’s value might become evident as additional chapters release at a reduced rate in the coming months but, after my first trek into the secrets hidden below the moon’s surface, I’m not entirely sure I care enough to continue my journey.